I am surely no Detroit expert. My time in Michigan totaled two days and I stayed in the suburbs (Farmington Hills is nice, if you are curious). But as a casual observer, I couldn’t NOT notice that the city can use some help. 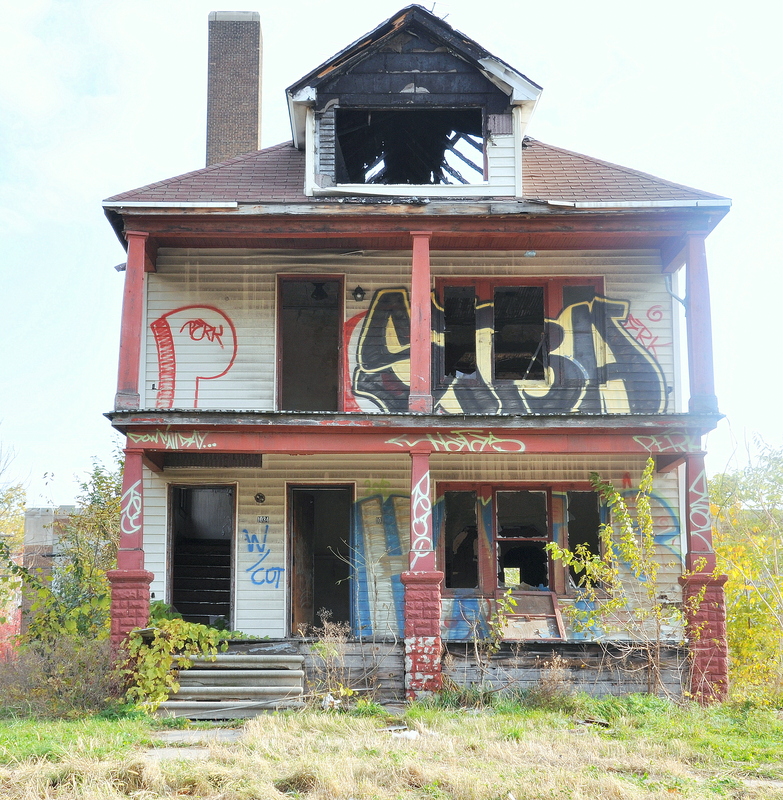 Detroit looks exactly like you think it does. I paid for my gas downtown through a sheet of bullet proof glass. Every sixth house is gutted and covered with graffiti, while the homes in between are kept up and lived in. I saw a lot of boards over windows. Which is why I’m glad that I “toured” the southwest part of the city as a participant in the Day of the Dead 10K. 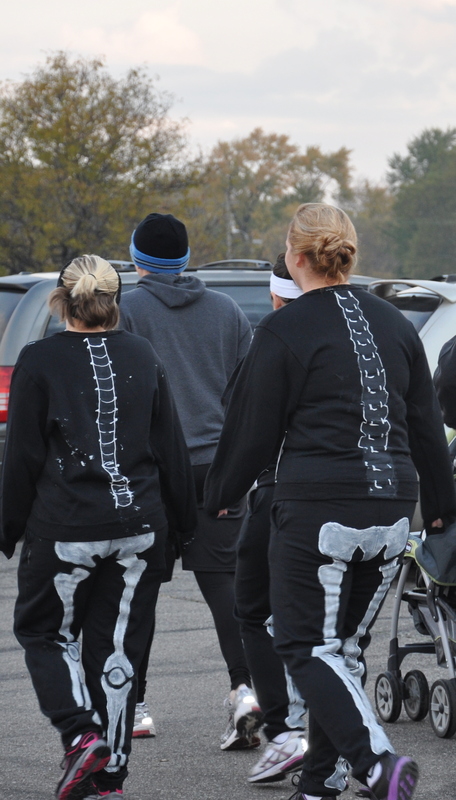 Runners are always good company to keep, even if they are dressed up as sombrero-ed skeletons. Though my non-Hispanic cultural lens, I’ve never really gotten the Día De Los Muertos. Jubilant skeletons, ghost parades, dancing on gravestones, and feasting joyously with the dead has always seemed a bit creepy to me. This race is exactly what I needed to get over my oh-so-traditional attitudes on death celebration. I talked to a gal while we were waiting in line for the bathroom (this is the prime runner bonding spot in ANY race, by the way). Her husband had just moved here from Mexico so she figured running the race was appropriate. She gave me a quick de-briefing of the holiday. “He really doesn’t believe in most of this, but we celebrate for tradition’s sake,” she said of her husband. She then told me about the family feasts that are prepared, the celebratory atmosphere, the memorial alters, and the bowls of water that are placed out so the dead can wash their hands before sitting down to eat with the family. I wondered if any of the dead would be running with us. If so, I hope they enjoyed the race as much as I did. Starting at Patton Park Recreation Center, the race goes though the historically hispanic part of Detroit, winding participants though two cemeteries and several neighborhoods. It’s not exactly an out-and-back run, but the course turns on itself several times, allowing you to see the front runners speeding past in the opposite direction. The race draws a pretty good crowd. The front runners aren’t Kenyans, but they are pretty speedy. The festivities were the best part of the race though. Most holiday races put out of appropriately themed cookies and call it good. Not in Southwest Detroit! People went all out. About 1/3 of the participants were dressed up, and everyone seemed to be in a festive mood. 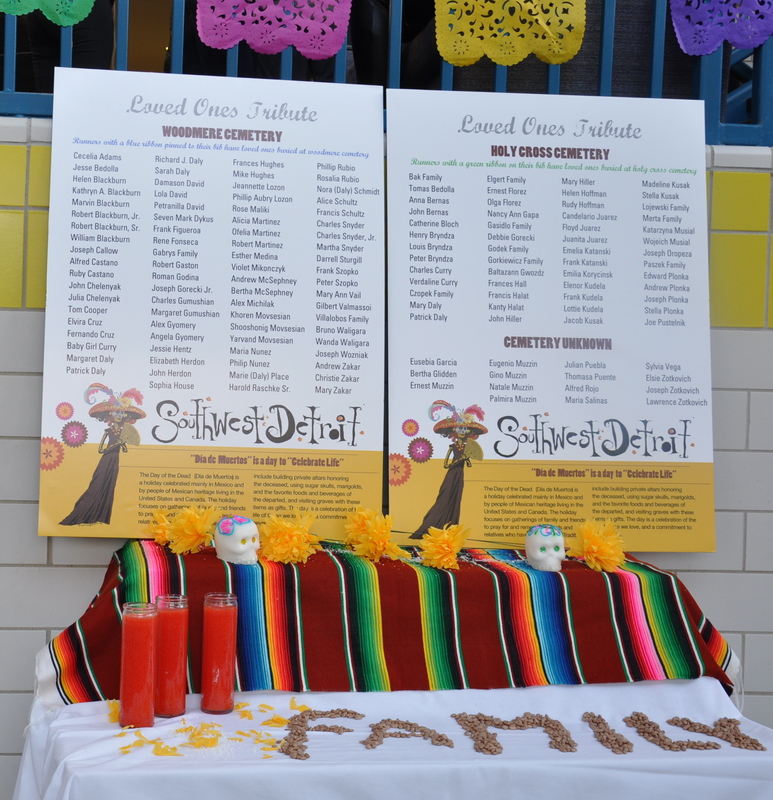 When you sign up for the race, you can mention the name of a loved one who is buried in one of the race-course cemeteries, and that name is added to the memorial near the race starting line. As we ran though the Holy Cross Cemetery, there were two different dance troupes, boom boxes places near headstones, entertaining us runners. Oh, and these cemeteries need to be mentioned, because they are spectacular. No rows of old boring headstones here. Graves were topped with huge statues, rising obelisks, and intricately carved pillars. There are even a few mausoleums thrown into the mix. The Woodmere Cemetery was especially striking. I think it might have been even cooler than the above-ground burial sites in New Orleans. Oh, that reminds me – there was a saxophone player at the place where the 10K and the 5K race split. This can sometimes be a hard part of the race for those running the longer distance, and the sax was a welcome distraction. After running six miles through gorgeous grounds with cheerful ghouls and witches covered in hibiscus flowers, I was warming up to the Day of the Dead. Maybe remembering deceased loved ones doesn’t have to be a sober and cold experience after all. 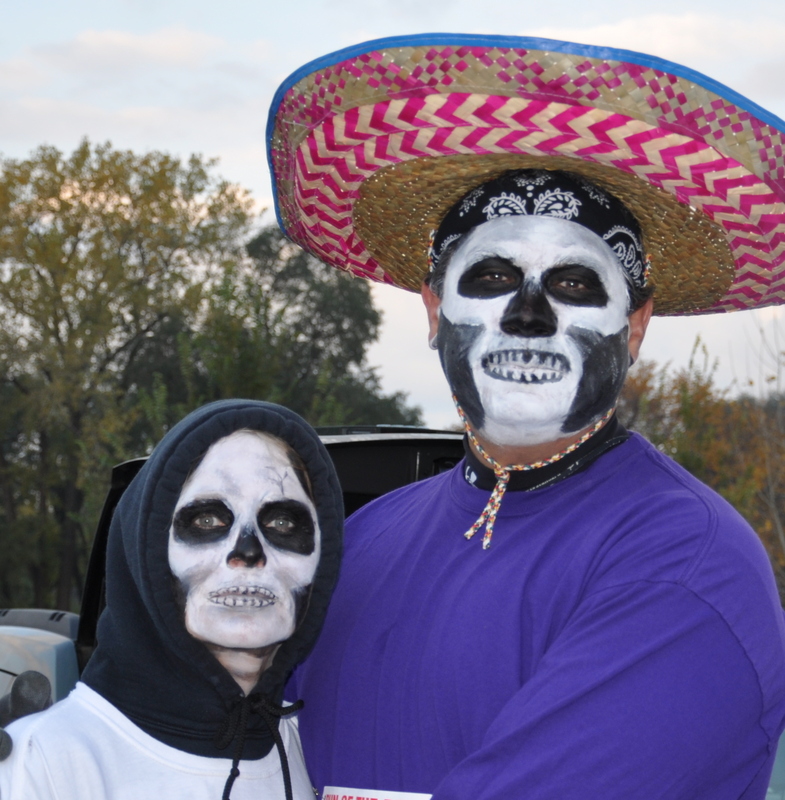 The Day of the Dead 10K is held annually in Southwest Detroit on one of the weekends close to November 1st. Check out the city’s website to register, and get to the race early. Day of race registration and number pick-up is a madhouse.